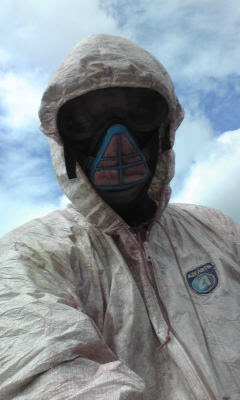 I finally remembered to shoot a photo of myself all done up in the gear I had to wear during the painting process. It was real fun wearing this in the heat of sub-tropical Okinawa. 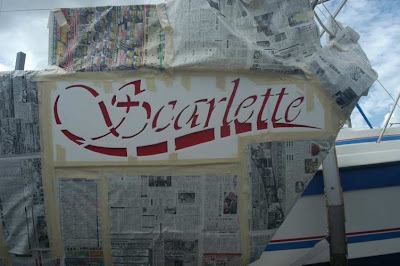 Banji sent the new logo for Scarlette today. Frankly it looks awesome! I had asked Banji to design something for me that was somewhat "classic" looking. She said she was trying to design something that looked somewhat feminine to go along with the name Scarlett O'Hara from "Gone with the Wind"
Now, I've got to change the web site to match the logo. Painting has finally begun. I'm beat today had to hacksaw some bolts from the front of the trailer to be able to safely place the jack stands underneath the bow of the boat. Now I'll simply have to move the trailer forward about three inches sand and paint and repeat. Finally, the bottom paint part of the bottom paint job has started. Just hope the weather holds. 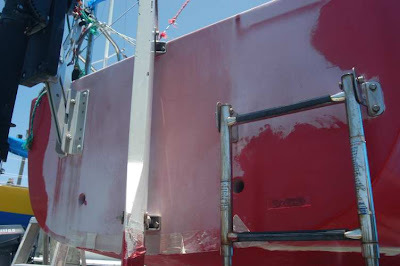 Today, spent most of the day applying the first of a two-step gel-coat restoration of the red part that's above the water line on Scarlette. See before and after photo above. Honestly, I was skeptical whether this product would work as good as advertised. 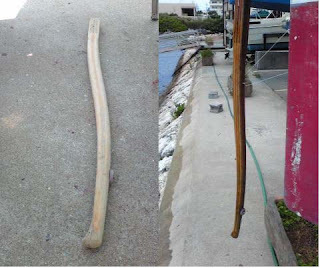 Well, the boys at the marina have already started asking, what did you use on that to get it like that? Sounds and looks like it works to me. I'm going to hold off on this portion of the restoration until after I get the bottom painted. Mainly because I got the jack stands from John with the stipulation that "if a typhoon rolls in, I'm going to need those back." John has a 42-foot Morris boat, I believe. 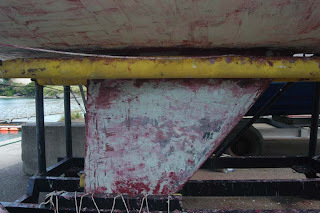 So, I've got to jack the boat up, finish a little sanding and begin the painting. I expect to be done in 3-4 days depending on the weather. I have to add 6 coats of the barrier coat (white) and 3 coats of bottom paint (red). Then she'll be ready to be put in the water. Should be getting in several orders through the mail this week that I'll be adding as I wait for the paint to dry. Spent only about an hour and a half today working on Scarlette. Sanded down the bow and started working on sanding the starboard side. Mostly importantly I was able to get a hold of someone at the marina who will let me borrow some jack stands so I can lift the boat off the trailer. This is huge. Will make all the sweating in the hot Okinawa heat worth it. I'm tired and not as sore as I thought I'd be. Plan is to try to finish as much as sanding as possible tomorrow and then on Monday get jack stands, varnish toe rails and on Tuesday start putting on the barrier coat. Tomorrow, I'm going to be sore. Spent about three hours sanding down the stern of Scarlette. Had to wear a full body suit, goggles and face mask and it was hot! But she feels like a baby's bottom now. 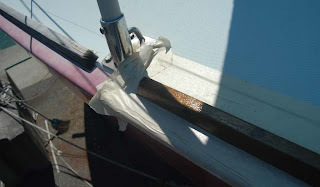 I scuffed the varnish job on the port-side aft toe rail getting out gear today from Scarlette. So I'll have to sand and varnish there again. I'll probably put a coat of varnish on then. I'll wait a day. I'm rushing the varnish jobs too much maybe and the coats are getting enough time to dry. Set up a tent on the starboard aft side so I can sand and varnish the remaining two rails on Saturday. I'm dead tired. That's all for today. The tiller is the steering "wheel" on Scarlette. When I opened the tiller cover -- two wood parts fell out of the case. These were the front part of the tiller. 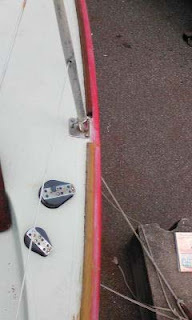 Today, I glued those back on to the tiller with a clamp and Gorilla glue and then sanded the glue off. First time ever doing this. I'm no expert but not too bad. Needed to do this because the part that was broke is essentially the handle and it would have felt wierd if this contoured area wasn't right. There were some space left over in the front part of the tiller. See middle photo. I probably should have filled that with wood putty, but didn't have any. The last shot is the newly varnished underside. Yes it does not look pretty but it will be functional. Then I sanded the entire tiller to varnish then hung the tiller off the stern to dry after varnishing it. I will probably lightly sand some of the impefections and re-varnish tomorrow. It'll need six coats of varnish. One down and five to go. Tomorrow will power wash the boat to get it ready for sanding. 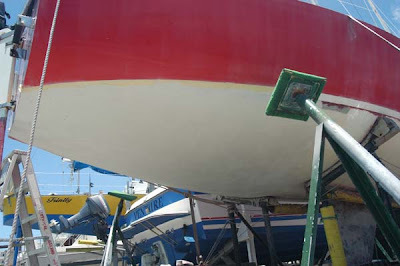 Still need to find someone at the Marina that has boat jacks so I can peel the rest and get the ship ready for a barrier coat. Once that comes in. I also varnished the middle port toe rail and the aft port toe rail. Will probably try making a tent tomorrow to cover the three remaining toe rails before varnishing. I forgot to shoot the after shot here and will upload it after I go to the boat on Wednesday. Same stripping dileema. Trailer keeps getting in the way. 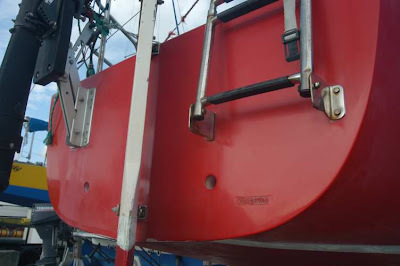 Problem on this side of the boat is that the keel is resting amost against the bottom part of the trailer. This will probably be the sand job. It's not easy to be a stripper. Today got the port side of the keel stripped. This is the hardest part to strip because essentially the trailer keeps getting in the way. 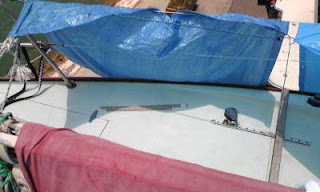 In the photos above you can see where I had the boat repaired. It is just underneath the water line. The keel area is going to be extremely difficult to sand later this week. Here's also what I stripped today from the keel area. That yellow area is part of the trailer. Not sure if my sander will fit in between this area. Spent most of Saturday varnishing the middle toe rail on the Starboard side. The second mate had swimming lessons at 2 p.m. and we grabbed something to eat on the way back. I used the blue canvas as a tent again so the varnish wouldn't blister. Starting to see the light at the end of the tunnel. I've still got about two days left of stripping, but I'm feeling ALOT better about the remaining days of this paint strip. I could probably finish in one day but I want to try to get all the paint off that I can with the chemical strip so sanding will go a lot faster. "Built" a tent this morning to stay under the shade and so the toe rail varnish wouldn't blister when I started sanding and varnishing them. Did no bottom paint stripping. Masking tape I used got stuck on the edges of the boat. Gotta watch out here. Don't want more mess to cleanup. As it is now... I've got to use the goo gone to get up the reside from the masking tape that essentially baked on to the deck. 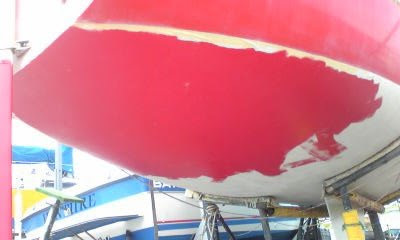 Spent several hours stripping paint off bow. Trying to get as much of the two coats of red paint and one coat of primer off before the repaint. 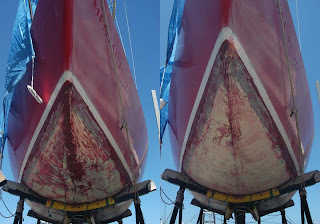 Found some blisters on the bow. These are minor and will fix them with resin myself. Also started varnishing the toe rails on the bow. Had to create a tent so the varnish wouldn't blister. I'm feeling like an old man today. Can't wait to finish this @#$% bottom paint stripping. 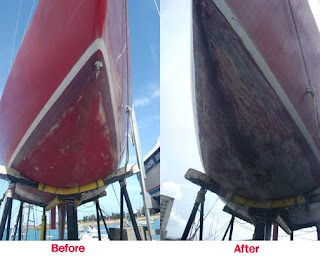 Someone remind me next time I start talking about stripping the paint off the bottom of a 24-foot boat (or any size boat) what a stupid boneheaded, I mean, what a challenging idea that actually is. Almost got all of it done today, but a Florida-like afternoon downpour (of course it's now sunny) cut my plans short. I'm not complaining though. Tomorrow, I'm going to try to finish the bow strip job. 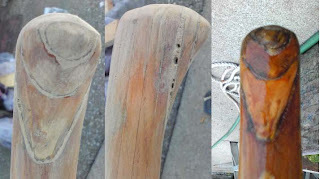 And maybe start sanding the bow toe rails. I'm soooooooooooo ready to get finished with this bottom stripping it's not even funny.